For best results, if possible, place bread out on a baking sheet several hours prior to making French Toast to let it dry out. Alternately, place in toaster on lightest setting (bread should not brown). In a large, shallow container, incorporate all ingredients (except bread) with a whisk until brown sugar is completely dissolved. Place a large frying pan over medium heat and spritz with cooking spray. Take one piece of bread at a time and dip in egg mixture, turning over quickly so bread does not go soggy, and place in skillet. Do not dip more bread than you can fry at one time. Process in batches, cooking about 3 minutes on the first side (or until browned), and 1-2 minutes on the second. Respray pan between batches. Discard left over egg mixture. 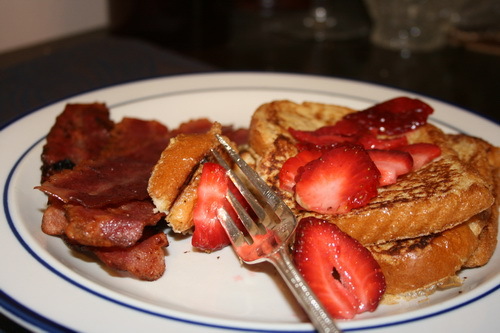 Serve with bacon (or turkey bacon, or soy substitute), fresh fruit (strawberries are exceptionally sweet right now, but blueberries, or even nectarines would be nice), and if desired, a drizzle of honey or maple syrup.